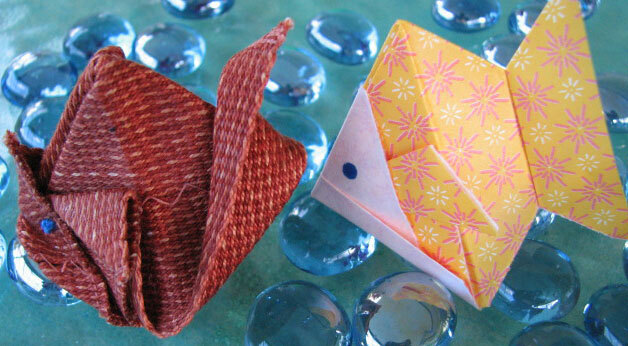 One of the first crafts I learned as a child was origami. I have enjoyed it for many years and thought it would be interesting to pair origami and inkle weaving. Yup, inkle origami. Probably two words not often said together, let alone done together. 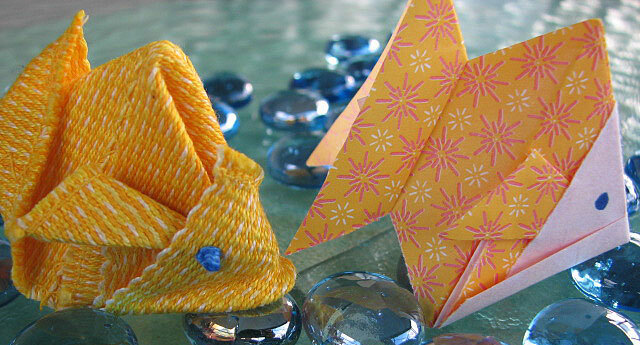 To commemorate Earth Day, I decided to try my hand at making origami goldfish. I have a few origami books, but the best and easiest instructions I found were in a wonderful post on the blog Nan: Now and Next. I folded these paper goldfish using her directions. 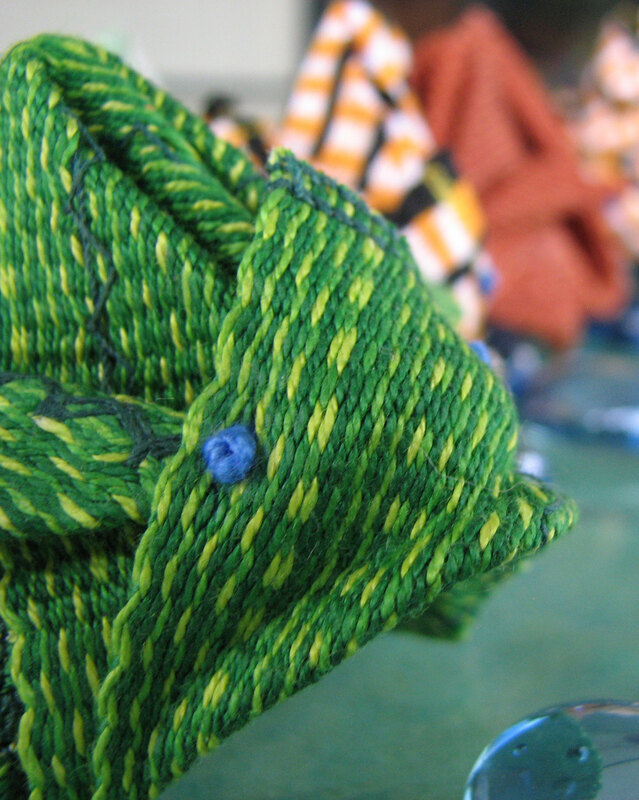 Even if you don’t want to make origami goldfish, her post is more than worth reading. It is also a touching post in honor of her Grammy. I’m going to try that Dr. Pepper float, and I don’t even like Dr. Pepper! 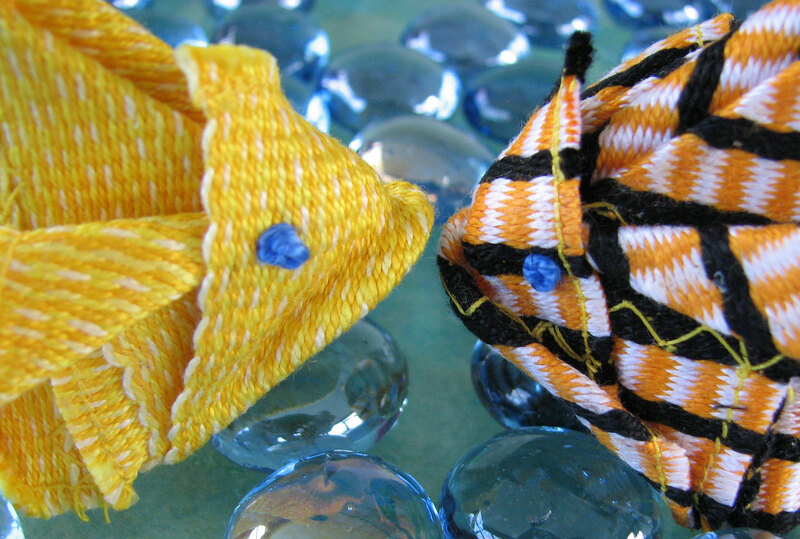 To make the goldfish I sewed together 4 pieces of a 1″ wide band cut 4″ long to make a 4”x4” square; using a zigzag stitch to join the selvedges, then sewed a straight stitch across the fringe edges (very short stitch length to catch the all the ends). Next, I saturated the square with spray starch and ironed it to make it stiff, but still foldable. Each time I made another fold I added spray starch then ironed. Tip: If you spary over wax or parchment paper, you can dip the folds in the overspary caught by the paper so you don’t waste your starch. The eyes are french knots stitched with needlepoint floss. Fish have blue eyes, right? The only modification I made to Nan’s pattern was to the tail. Instead of cutting the tail I just folded it up and pulled it back a little to make it stand. I didn’t want to cut the bands and have fraying. 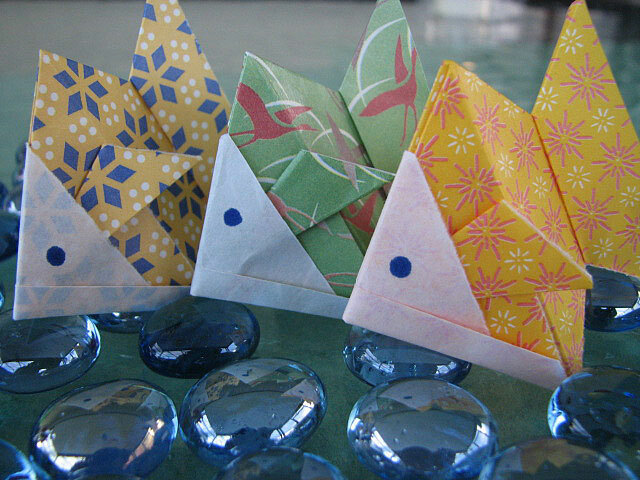 Do they look like origami fish or am I just wanting them to? I’ve been looking at them way too long. To quote my son’s book, Little Helpers, “When I turn off the faucet while brushing my teeth there is more water for the fish in the rivers.” My inkle goldfish are not suiting up to go for a swim in the river, but we are teaching our son to conserve water for the fish that do and for all of us who depend on accessible clean water. Here is a list of 100 Ways to Conserve Water. Wow! You made me blush. Thank you. These are so cute! What a great learning tool–these would be great to have as part of the weaving demo kit for schools…. Hmmm, Nancy, that is an interesting idea. We should look into that. Thanks, I love your fun idea and I am so happy some little thing I shared on the web helped you to create it. Also…I’ll have to try out the French Knot…lovely! One tip: stick to Root Beer when it comes to ice cream. 🙂 Great link to 100 ways to conserve water. Wonderful post, thoughtful. Thanks for the tip, I a big root beer fan anyway!